This entry was posted in Uncategorized and tagged bath and body recipes homemade, bath gels and lotions, bath jelly, bath oils diy, body safe fragrance, body scrub recipes, chocolate notes, cold process soap recipes, delicious fragrance, diy aroma bead car air freshener, diy bath gels, diy bath oil beads, diy body wash glycerin, diy candles, diy natural body wash, diy room fragrance, diy room fragrance recipes, diy room scent jars, diy room scents, easy soap recipes, floral notes, fragrance, glycerin soap recipes, goat milk soap recipes, hand carved candles, handmade bath and body products, homemade soap recipes, how to burn incense, how to make potpourri, how to make shower gel from scratch, incense cones, incense sticks, melt and pour soap recipes, natures garden, Organic bath and body products, princess fragrance, Princess Type Fragrance Oil, room scent diy, room spray formula, soap making supplies, soy wax candles diy, wholesale fragrances on July 19, 2016 by Deborah Ward. Princess Type Fragrance Oil is a beautiful and delicious scent by Natures Garden. This aroma is a complicated and beautiful blend of sweet florals and fruits, tasty dark chocolate, sweet frosting and vanilla fragrance that have woodsy and musk scents which create a fragrance oil that is as delicate and royal as any princess should be. We hope that you enjoy this sweet and delicious scent in all of your various creations. What Does Princess Type Fragrance Oil Smell Like? This fragrance oil by Natures Garden is for flirtatious women, who enjoy adventure and excitement. The whimsical blend of water lily, lady apple, mandarin meringue, golden apricot skin, ripe pink guava, Tahitian flower, wild tuberose, dark chocolate, pink frosting accord, precious amber, forbidden woods, royal musk, and chiffon vanilla. How Do Our Customers Use Princess Type Fragrance Oil in Room Scenting Recipes? Hand carved candles can be created with this complex and delicious fragrance oil. As long as bath and body creations are made of either vegetable waxes or paraffin wax, then they can include this lovely fragrance oil at a rate of 10% or less. Both Joy Wax candles and WOW wax creations can use this flirty scent perfectly. Also, diy soy wax candles can be created to be nice and strong with this aroma. Our testing has shown Princess Type Fragrance Oil to be gel compatible. But, we do recommend testing each scent in gel wax to be sure. Although we suggest that candles including this delightful fragrance be pure and unscented, each princess is unique and can be colored as you see fit. However, we highly recommend that you don’t use any crayons as candle dyes as they clog wicks. Other various diy room fragrance recipes can be created with this exciting fragrance oil. Those of our customers that enjoy creating their own room scents, such as incense sticks, incense cones, room spray formulas, and many more related creations, can include up to 50% of this gorgeous fragrance. All sorts of homemade cleaning recipes can be scented with no more than 3% of this scent. Also, diy aroma bead car air freshener can be scented well with this delightful aroma. How Do Our Customers Use Princess Type Fragrance Oil in Bath and Body Recipes? This beautiful fragrance oil is a gorgeous choice for scenting handmade bath and body products of all kinds. All types of products similar to bath gels and lotions, bath jelly recipes, diy perfume spray, or others can be created well with up to 5% of this princess fragrance oil. Additionally, cold process soap recipes are able to be scented with the body safe rate of 5%. In fact, our Cold Process Soap Testing Results have been shown to be perfect for this feminine fragrance oil. These soaps will have no ricing, no acceleration, and no separation. Also, the final bars will have a good scent retained and they will discolor to a light beige color. We recommend that products including this scent should have no color added. However, you can add any color or amount of soap colorants to you products as long as you avoid using candle dyes. This entry was posted in bath and body, cold process soap, Fragrance Oils, Natures Garden, Soap making supplies and tagged cold process lavender soap, cold process soap, cp soap with herbs, diy projects, diy soap projects, easy soap recipes, fragrance oil, fragrance oils, fragranceoil, fun soap recipes, homemade, how to make lye soap, how to make soap, how to make your own soap, in the pot swirl method, in the pot swirl soap, in the pot swirl technique, lavender cp recipe, lavender fragrance, lavender scent, lavender soap, lavender soap recipe, lye soap, natures garden, soap fragrance oil, soap fragrance oils, soap making supplies, soap recipe for cp, soapmaking supplies, steps for making soap, wholesale fragrance oils on June 6, 2014 by Deborah Ward. For us, making cold process soap is almost a daily occurrence. 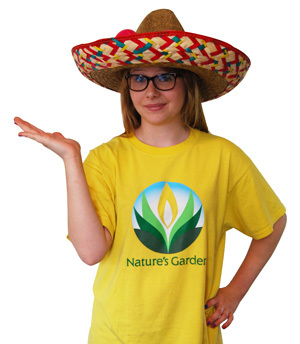 With all of the fragrance oils that are tested, new samples that are tested, and fun recipes that are made, the creative team at Natures Garden is always busy doing something. A few days ago, we wanted to make a Lavender Soap Recipe (with cold process). Through our brainstorming, we created a great recipe, with a cool design concept that even included sprinkling a small amount of lavender flowers to the top of the soap. 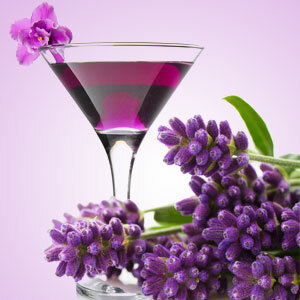 Seeing that Lavender Martini Fragrance Oil was not yet used for a recipe, we thought it would be the perfect fit. The soaping results showed that it was a “Perfect Pour. No ricing, no acceleration. Very great unique scent. No discoloration. Scent is clean.” So, soaping with this oil was not going to pose any issues. To use one word to describe working with this fragrance oil, it would be flawless. The color design for our recipe contained 4 colors including: a light purple, medium purple, dark purple, and finally white. Not only did the fragrance allow for ample time to get these colors achieved, but we were also able to accomplish a gorgeous in the pot swirl too. So now, since we are on the topic of how wonderful this fragrance oil was to work with, it should also be mentioned how fabulously strong and amazing this scent smells. Once the Lavender Martini scent was in the soap batter, it seemed to fill the work area instantaneously. The lavender martini aroma was strong! We were all super excited as to how this soap loaf recipe was going to turn out. Even just walking past the loaf as it set up was a foreshadow of just how aromatic the scent was. The next day, we unmolded and braced ourselves for the soap slicing. As we sliced the soap loaf, it seemed that with each slice the smell of lavender martini was more intense in the air. This recipe was just an overall win in every category! So, if you are looking for a great cold process soap scent, and your interest is peaked in giving this fragrance oil a try in cold process soap, we highly suggest you do. Like we mentioned earlier, we soap a lot of fragrances, but this one was definitely eye opening. To view the Lavender Cold Process Soap in its entirety, please click on this link. It will provide you with the recipe weights, and step by step instruction. But, this fragrance will work for your own recipe too if you wanted to go that route. This entry was posted in cold process soap, Fragrance Oils, Natures Garden, Soap making supplies, soap recipe and tagged childhood scents, cold process soap, cp recipe with mp soap embeds, diy projects, diy soap projects, easy soap recipes, embedding cp soap, fragrance oil, fragrance oils, fragranceoil, fun soap recipes, homemade, how to make lye soap, how to make soap, how to make your own soap, lye soap, mp embed cp, mp embed cp recipe, natures garden, soap fragrance oil, soap fragrance oils, soap making supplies, soap recipe for cp, soap that smells delicious, soaping experience, soapmaking supplies, steps for making soap, summer craft projects, summer scents on May 12, 2014 by Deborah Ward. There have been a few times that we have made a recipe that involved both melt and pour soap and cold process soap. The first was Baileys Spotlight Cold Fashioned Lemonade Soap and the second time was Cindy’s Blackberry Sage Soap. However, both times the melt and pour soap was placed on top of the cold process soap. 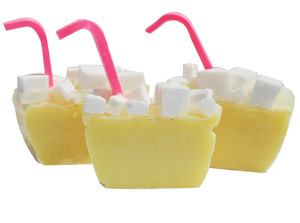 This time, we wanted to create a recipe using melt and pour soap inside of cold process soap. The theme of this mp embed cp recipe was centered around Natures Garden’s Bubble Luscious Fragrance Oil. With summer time quickly approaching, we thought this would be a wonderful fragrance oil to spotlight in a fun recipe. Now since Bubble Luscious Fragrance Oil is a childhood memory scent, we wanted to visually capture the essence of fun, carefree, summertime memories. Plus, Bubble Luscious scent is loved by children and adults alike, so we wanted a soap recipe that would appeal to all ages. Once we figured out what we wanted the soap to look like, it was then time to figure out the specifics. We knew that we would have a creamy look from the cold process soap. This would be the perfect look for the main portion of the loaf, including the creamy, whipped looking top. But, in order to accomplish a transparent look in the soap curls, we needed to use the Melt and Pour Soap.SLS Free Clear . You can also use our diamond clear melt and pour soap (however, we are currently waiting for a shipment of it to arrive). 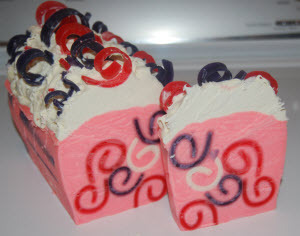 Now, these transparent curls would be used both in the cold process soap and also for a decorative topping to the soap. However, since we also wanted to include a white swirl in the soap, Goat’s Milk Melt and Pour Soap was also included in the mp embed cp portion. We felt that through the combination of both soap mediums (cp and mp), we would be able to present a really fun project to match this really fun scent and quite the playful and swirly design too. 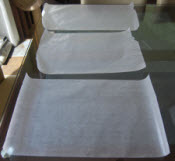 Step 1: On a flat surface, cut and lay down 3 larger pieces of wax paper. Step 2: Prepare the Purple Swirls: Weigh out and melt 200 grams of Clear M&P Soap. Stir gently. Once your soap is melted, add 35 drops of fun soap colorant deep purple and 10 grams of bubble luscious fragrance oil. Stir well. Step 3: Next, pour all of the purple soap unto one sheet of wax paper. If you have any air bubbles, spritz the soap with alcohol. Step 4: Prepare the Red Swirls: Again weigh out and melt 200 grams of Clear M&P Soap. When melted, this time add 10 drops of fun soap colorant tomato red and 10 grams of Bubble Luscious fragrance oil. Stir. 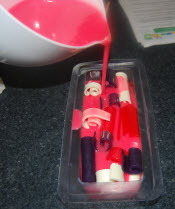 Step 5: Once scented and colored, pour the red soap onto another piece of wax paper. Spritz with alcohol if needed. Step 6: Prepare the White Swirls: Weigh out and melt 200 grams of Goats Milk M&P Soap in the microwave. Once melted, add 10 grams of bubble luscious fragrance oil. Stir well. Step 7: Finally, pour the white soap unto the last sheet of wax paper. If necessary spritz with alcohol. For now, this is all the melt and pour steps you can do. It is now time to start the cold process steps. 79 grams of CASTOR Oil- 16 oz. 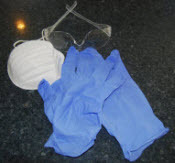 Step 1: Put on your safety gear. Step 2: First, make your lye solution. Then, weigh out and melt the soaping ingredients. Once melted, separate out 30 grams and place it in one of your mixing bowls. To this add 7 grams of titanium dioxide. Stir well. Completing this step will help you smoothly incorporate the titanium dioxide in the soap batter. Set this bowl aside. Step 3: Once the lye solution has cooled, stir in the 40 grams of sodium lactate. Step 4: Back to the Melt and Pour Soap: Remove the purple, red, and white soap from the wax paper. Then, trim off any jagged edges. Next, cut 3 x 3 inch squares out of each color. Make as many 3 x 3 squares as possible until all of the soap has been used. Then, gently curl the soap in a loose fashion. The one thing we can not stress enough is loose. This will help the soap batter fill the embeds so that you do not have air pockets. Once all of the soap has been loosely curled, place all 3 colored curls into your square loaf mold. With the jagged leftovers of the soap, make as many curls as you can. These will be used to decorate the whipped topping. Step 5: When both the soaping oils and the lye solution are ready, combine them together. Then, using your stick blender, emulsify. Next, add your fragrance oil. Stick blend again to light trace. 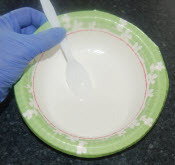 Step 6: When your soap batter is at light trace, get your bowl with the titanium dioxide. Now, place 400 grams of soap batter into it. Then, to the remaining soap batter, add the 10 grams of fun soap colorant neon pink. Use your stick blender to incorporate, but do not mix too long; you still want your soap batter to be on the thin side. Step 7: Slowly pour the soap batter into the mold. This will also help to eliminate air pockets in your soap. When the mold is filled, gently tap it to release any air pockets. Step 8: Next, stick blend the white soap bowl. Then, set aside. Once the pink soap has thickened enough, start to carefully heap the white soap on top to resemble whipped topping. Step 9: Finally, place some of the m& p curls (red and purple) on top. Step 10: After 48 hours, place the soap into the freezer for about 4 hours. Then, remove the soap from the mold and let it reach room temperature. When ready, cut the soap into slices. Allow them to further cure before using. That is it. Although this post may seem daunting, it really is not that bad, especially if you have soaped before. In the end, this homemade project is totally worth it. You will love how delicious your soap looks and smells!